Mt. 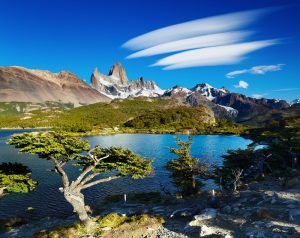 Fitz Roy and Cerro Torres are arguably two of the most stunning peaks in the Argentina Patagonian Andes. These jagged, monolithic towers of granite thrust into the sky creating some of the most grandiose views in Patagonia. Mount Fitz Roy is located in the Southern Patagonian Ice Field on the border between Argentina and Chile, near El Chaltén village and Viedma lake. Francisco Moreno, a renowned Argentine explorer, christened Mount “Fitz Roy” after Captain Fitzroy of the HMS Beagle, the ship that voyaged around South America with naturalist Charles Darwin, author of "On the Origin of Species." Summer, in the southern hemisphere, is the most popular time to visit Patagonia. From El Chaltén hike to Laguna Capri, a blue water lagoon surrounded by lush forest that is a two-hour trek, one way. From there you can appreciate a fantastic view of the Fitz Roy massif. The trail to Laguna Capri is an excellent introduction to trekking in Patagonia. However, the first hour is quite steep, so we recommend that you do some training, preferably in the form of day hikes, before you go. 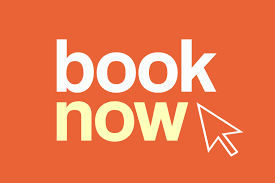 If you want to escape the spring and summer crowds during October-March, fall is a fantastic time to visit. As cooler weather sets in during April and May, the crowds die down, the winds calm, and the colors are spectacular. 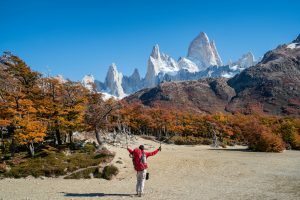 It won't be hard for you to understand why people say it's easy to "fall" in love with our four-day Fitz Roy and Cerro Torre Trek during the Autumn months! 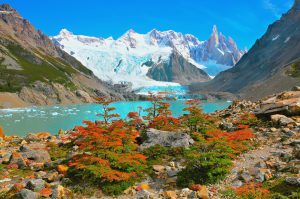 Foliage and lichen turn various shades of yellow, orange, and red, brilliantly highlighting the green and blue glacier-speckled lakes resting at the base of Cerro Torre and Fitz Roy creating abundant opportunities to take stunning photographs. Icebergs float about, glistening like diamonds in the late afternoon sun as you hike along the trails from one picturesque destination to another. 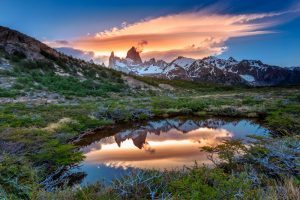 The hikes around El Chaltén, including the trek to Laguna De Los Tres at the base of Fitz Roy, are arguably among the most beautiful in the entire Patagonia region. Laguna De Los Tres is a picturesque lake that draws hikers from across the globe to enjoy one of the most visually stunning natural landscapes in the world. On this short but stunning adventure, you will also undertake the four-hour trek to Laguna Torre, a lake formed by glacial meltwater that offers beautiful reflections and jaw-dropping views of the dramatic Cerro Torre massif. 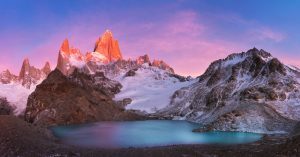 The breathtaking beauty of the Los Glaciares National Park in Patagonia makes our 4-Day Fitz Roy and Cerro Torre Trek a quick and exciting adventure that you will cherish for a lifetime.